One of the basic tenants of Lean is “Respect for People”. There is much history behind it which I won’t go into in this blog; I’ll save that for another day. Another basic foundation of Lean is that we “Solve problems according to the scientific method”. That is, we take problems to root cause and put in countermeasures against those root causes. The countermeasures form a hypothesis that says - if we do these things then the root cause will be eliminated and the problem will not re-appear. Then we run experiments and test the hypothesis and learn from the results. Putting these two ideas together we see that in problem solving, we need to look at the processes in which people do their work. We believe that people are basically good; it’s the processes they use that are causing the problems. The people are merely executing the broken processes. In problem solving we keep asking “why” to get to the root cause of a problem, and many times we see the root cause is actually a process problem. We need to be hard on the process to understand what is it about the process that is broken and is allowing these problems to appear. We also need to be hard on the process in designing countermeasures so we build robust processes where it’s easy for people to execute them. 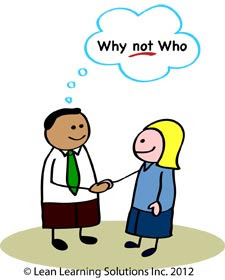 Contrast the “5 why” process of getting to root cause with one that asks the “5 who’s” in trying to get to root cause. That type of questioning is hard on the people and doesn’t get to a true root cause. What it does do is violate the lean pillar of “Respect for People” and so does a great job of turning people off and undermining any engagement of people in improvement work.